For years, expectant mothers have worried (or assumed) that it’s not healthy for a baby if you get dental work done while you’re pregnant. Surprisingly, the opposite may actually be true! Certain types of dental problems — such as periodontal/gum disease — can significantly increase your risk of preeclampsia and going into labor prematurely. If you’ve noticed symptoms of swollen or bleeding gums, it’s best for expectant women to see a dentist as soon as possible rather than delay care until after they’ve had the baby. What About Local Anesthetic or X-rays? Our Milton dental team follows all recommended dental precautions for expectant women, as advised by obstetrician and gynecological experts. We’re even happy to discuss your treatment plan with your OBGYN if needed. Truthfully, local anesthetic (the numbing medication that’s used to keep you comfortable during treatment) hasn’t been shown to pose any harm to a developing fetus; even if it contains epinephrine, a vasodilator that helps the drug work more effectively. These medications can cross into the placenta, but they are used in such small amounts that there is not a considerable risk. As far as X-rays, modern digital radiographs use significantly less radiation than conventional dental films once required. Every patient — expectant or not — wears a protective lead apron that blocks possible scatter radiation from coming into contact with reproductive organs or a developing baby. If you have an X-ray before you realize you’re pregnant, or need an X-ray due to an emergency treatment for a toothache, you’re still better off for it than avoiding dental care. 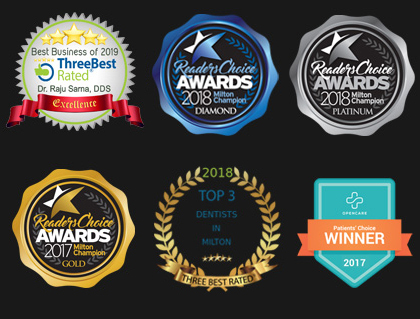 Don’t worry; our Milton family dentists are here to keep you comfortable. We know that it can be challenging to move or lay certain ways when you’re expecting. As such, we make every accommodation possible to ensure that you’re able to sit in a certain way that allows us to work efficiently without making you feel physically uncomfortable. Pregnancy professionals recommend getting preventative and necessary dental work completed during your second trimester. Why? Because the vital first trimester of your baby’s development has been reached, but the uncomfortable third trimester (where you may have difficulty laying back) hasn’t yet become a problem. If you want elective dental work that isn’t essential to treating an active infection, it’s best to delay the treatment until after you’ve had the baby. Examples would be getting a smile makeover, veneers, teeth whitening, etc. However, a dental abscess, active gum disease, or painful toothache should be completed as soon as possible. Oral bacteria and infections are known to spread from mother to child. Additionally, there is the risk of setting yourself up for an extremely uncomfortable dental emergency when you least expect it. Whether you’re planning on becoming pregnant or are an expectant mother, Hawthorne Village Dental Care in Milton is happy to tailor our services in a way that benefits your smile and your baby. Call today to schedule!